A small terrace just off King Street is the home of one of Australia’s favourite coffee beans. 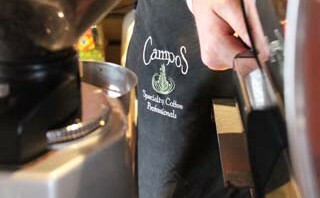 We’re here for an afternoon pick-me-up, and fall into line with a large queue of the Campos faithful. The counter service is that elusive mix of swift yet attentive and friendly. Past the counter, the high chairs and tables (if available) lift you into a quaint coffee realm. It is slightly quieter, with framed coffee portraits and artefacts hanging on warm yellow walls. A rarefied spot to enjoy the Campos sacrament. My espresso is full-bodied and has an invigorating dark-chocolate aroma; it finishes with a long aftertaste. The legendary Campos rosetta floats on my latte supported by a divine velvet consistency which picks up the dark chocolate and floats with it. The coffee is, paradoxically, a deeply fulfilling tease -so what can you do, but come back for morning mass? Went there with a friend on a Saturday. Had a Flat White and a Piccolo. They had a couple of baristas working and still only managed to serve just above average coffee.